Habit at Auwahi, Maui, Hawaii, USA. February 22, 2003. 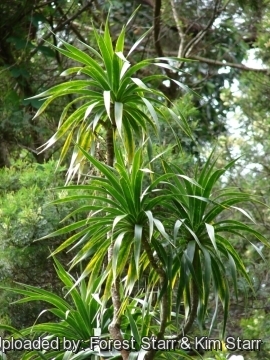 Origin and Habitat: Dracaena auwahiensis (Pleomele auwahiensis) is endemic to the islands of Maui and Molokaʻi in Hawaiʻi islands, USA. Altitude range: It grows at mid to low elevation (610–1,220 metres), but not coastal. Habitat and Ecology: It is restricted to remnants of lowland lowland dry, and sometimes open mesic or moist forest in gulches on Central Molokai and the northwestern flank of Haleakala; or on old lava flows on the southern flank of Haleakala, Makawao and Olinda on Maui. It is threatened by habitat loss. There are probably fewer than 5,000 or 10,000 individuals remaining in an undetermined number of occurrences. It is in some places still fairly common. However, due to the array of threats to this species, regeneration is very poor and most of the remaining individuals are mature trees. Threats to the species include feral pigs, goats, deer, rats, invasive alien plants, grazing, and fire. The tree also suffers from limited dispersal, with almost all fruits falling directly under the parent canopy, poor dispersal can contribute to increased seed predation levels by introduced rodents. Pleomele hawaiiensis var. mauiensis O.Deg. & I.Deg. 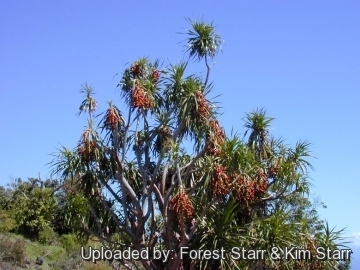 Description: Dracaena auwahiensis (a.k.a. 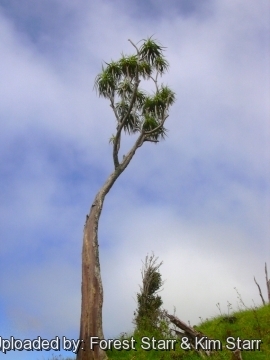 Pleomele auwahiensis or Chrysodracon auwahiensis) is a slow growing, few-branched to many-branched tree ranging in height from 1.5 to almost 7,5(-10) m tall. The flowers grow in large, branched bunches and are yellow to greenish yellow. Derivation of name: The former generic name "Pleomele" is derived from the Greek pleon, many, and melon, apple, in reference to the large inflorescence that produce many fruits. 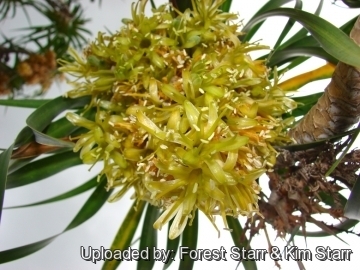 The generic name "Chrysodracon" is from the Greek Chrsyo, golden, and dracon, dragon, referring to the unique yellow (golden) flowers of this genus; other dracaena have white, green and/or purple tepals (flowers). The specific epithet “auwahiensis” refers to Auwahi, Maui, a remnant native dry forest set aside to preserve native flora of Maui. Stem: Branches thin and flexible with obvious scars where old leaves have fallen off. The bark on larger trunks is smooth and grey. Leaves: Tough leathery to papery in texture, flexible, medium to dark green, sword shaped, gradually tapering from near middle, ranging between 15 and 35 cm long and 0.9-1.6 cm wide, arranged in a spiral along the branch and mostly clustered toward the end of the branch. Inflorescences (panicles): About 17-34 cm long , abundant and hanging. Flowers: Showy, tubular, greenish yellow, 45-50 mm long. Blooming Period (In Hawaii): June-July. This species will flower after maturity (5 years.). Fruits (berries): Round from 6-12 mm in diameter in large clusters of from 25 to over 200 fruit and will hang on the plant for a month or two. The unripe fruits are hard and green or tan in colour. As they ripen, they soften and turn orange or red. The fruits generally ripen in the summer and fall. Each berry contains 1 to 3 seeds. 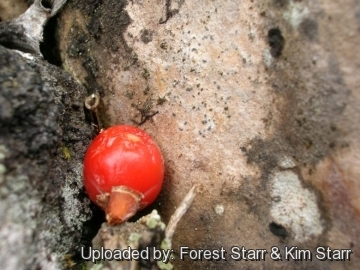 Seeds: The seeds are white or yellow, kidney-shaped or somewhat round and less than 6 mm long. 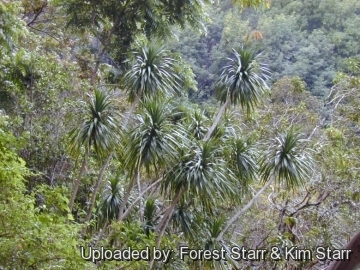 1) Forest & Kim Starr “Pleomele auwahiensis (Halapepe)”. Plants of Hawaii. <http://www.starrenvironmental.com>. Web. 3 Jan. 2015. 2) World Conservation Monitoring Centre 1998. “Pleomele auwahiensis.” The IUCN Red List of Threatened Species. Version 2014.3. <www.iucnredlist.org>. Downloaded on 03 January 2015. 3) Wikipedia contributors. "Pleomele auwahiensis." Wikipedia, The Free Encyclopedia. Wikipedia, The Free Encyclopedia, 17 Mar. 2013. Web. 3 Jan. 2015. 4) "Pleomele spp". Hawaiian Native Plant Propagation Database. University of Hawaiʻi at Mānoa. <http://www2.hawaii.edu/~eherring/hawnprop/ple-spp.htm> Retrieved 3 Jan. 2015. 5) Native Plants Hawaii. “Chrysodracon auwahiensis” <http://www.nativeplants.hawaii.edu> Web.3 Jan. 2015. 6) Culliney, John L., and Bruce P. Koebele. 1999. “A native Hawaiian garden: how to grow and care for island plants.” Honolulu: University of Hawai'i Press. p. 57-59. 7) Lamb, Samuel H. 1981. “Native trees and shrubs of the Hawaiian Islands.” Santa Fe, New Mexico: Sunstone Press. p. 26. 8) Lilleeng-Rosenberger, Kerin. 1996. “Plant propagation notebook.” Unpublished materials: National Tropical Botanical Garden. 9) Stratton, Lisa, Leslie Hudson, Nova Suenaga, and Barrie Morgan. 1998. 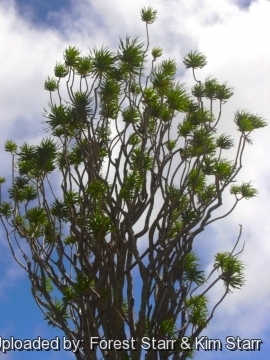 "Overview of Hawaiian dry forest propagation techniques. 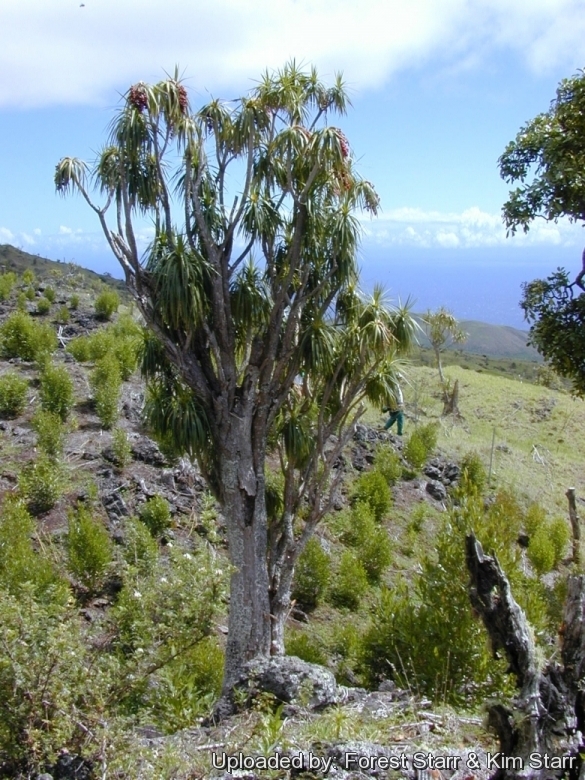 Newsletter of the Hawaiian Botanical Society" 37 (2):13, 15-27. 10) Wagner, Warren L., Darrel R. Herbst, and S. H. Sohmer. 1990. “Manual of the flowering plants of Hawai'i.” 2 vols, Bishop Museum Special Publication 83. Honolulu: University of Hawaii Press and Bishop Museum Press. p. 1351-1354. 11) J. Juvik, J. DeLay, M. Merlin, M. Castillo, L. Perry, K. Kinney "Endangered Plants and Threatened Ecosystems on the Island of Hawaiʻi" by, page 30. 12) Harold St. John "Monograph of the Hawaiian Species of Pleomele (Liliaceae)," pages 171-189. 13) Rev. Kaluna M. "Native Hawaiian Medicine--Volume III" pages 47-48. 15) Kartesz, J.T. 1994. "A synonymized checklist of the vascular flora of the United States, Canada, and Greenland." 2nd edition. 2 vols. Timber Press, Portland, OR. 16) Pei Luen-Lu and Clifford W. Morden "Phylogenetic Relationships among Dracaenoid Genera (Asparagaceae: Nolinoideae) Inferred from Chloroplast DNA Loci", pages 91, 101. 17) “Pleomele auwahiensis - St. John” NatureServe. 2014. NatureServe Explorer: An online encyclopedia of life [web application]. Version 7.1. NatureServe, Arlington, Virginia. Available http://explorer.natureserve.org. (Accessed: January 3, 2015 ). 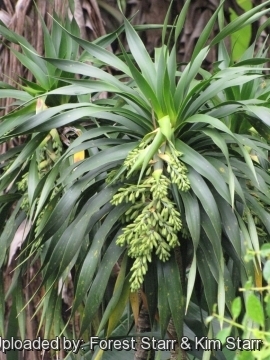 Cultivation and Propagation: Dracaena auwahiensis (Pleomele auwahiensis) is very drought tolerant and adaptable, but seldon cultivated as an ornamental tree for parks and gardens. It will grow in warm subtropical or tropical climates and prefers dry conditions. It appears to be easy-to-grow and rewarding. It establish at low elevations with very little extra care or watering required. But young plant are happy growing indoors. Growth rate: It grows slowly, but well worth the effort. Soils: Need very well drained soils. Give the plant an airy growing medium consists of non organic material such us clay, pumice, lava grit, and peat or leaf-mould. It like quite small pots, repott in very later winter, early spring. It will be content in its position and with its soil for years. Water Requirements: Water regularly during the active growing season from March to September, but do not overwater this plant. No water should ever be allowed to stand around the roots. Keep almost completely dry in winter. Wing tolerance: Has a good wind tolerance. Only downside is from very strong winds, the plants may smash to to the ground... best to plant in such a location where winds are not a big issue. Pest & Disease: Hala pepe is prone to scale and root chewing arthropods attack young plants. Corn worms attack roots. Also root rot and Cyrcospora fungal crown rot. It is very unlikely to lose this plant from root rot from excessive water. Pruning: None necessary, except to remove dead lower leaves and spent fruit stems (panicles).Drastic pruning usually disfigures the plant. Garden uses: The extraordinary appearance of this tree ensures it a place in parks and large gardens wherever there is a suitable dry tropical climate. It also cultivated as specimen plant; and large container plant with dramatic sword-like foliage. It is very drought resistant but susceptible to frost. It makes a good house plants for a Dracaena, though recommend higher light if possible. Early Hawaiian Use: Early Hawaiians used the leaves in bathing and steam baths for chills (liʻa), headaches, fever, and thought to stop burning temperature or sensation. The soft whitish to reddish wood was used by early Hawaiians to make idols (kiʻi) and to decorate altars. Flowers are used for leis ans the latex is used as an ingredient in canoe paint. Propagation: Seeds. The seeds must be removed from the fleshy fruits. Best results are obtained with fresh seed. Plant the seeds in shallow containers in a quick draining mixture and cover the seeds with green sphagnum moss. Remove most of the moss when the seeds begin to germinate. Keep the containers in a covered, shaded area to protect them from rain damage. The seeds germinate in 2 to to 6 months, and the germination rate is usually only 5 to 10%. The seeds rot easily if the medium is too moist or if not pre-treated with fungicide. Transplant as soon as possible. Fresh Pleomele seeds lose viability when stored. If seeds must be stored, the cleaned, air dried seed should be put in an paper bag or envelope and placed in an airtight container with desiccant.